Winner of: Top 10 PAL Awards Pick Nominee: 2016 Montana Treasure State AwardAlthough Matty s art teacher has warned him that too much glue never dries, Matty loves glue. After all, he and his dad make oodles of glue projects at home. One day during art class, Matty finds the fullest bottles of glue, and the fun begins. With a squeeze and a plop, Matty pours a lake of glue before belly-flopping right in the middle and finds himself stuck to the desk. When Matty s dad arrives at the school, instead of being mad, he celebrates his son s creativity and calls him a work of art. 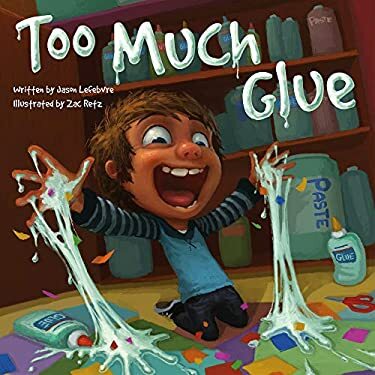 With vibrant language and artwork and a wild, silly plot, Too Much Glue is sure to appeal to all children who love to get messy." New (237 available) BRAND NEW. Over 1.5 million happy customers. 100% money-back guarantee. Make your purchase count: support Better World Books' worldwide literacy partners.